Good afternoon, space fans! It's been another fascinatingly productive week on the ISS. Here's what's up! Friday marked the 25th anniversary of the Hubble Telescope. Keep shooting those stars! Thanks to the recent arrival of the Space X Dragon capsule, the ISS crew had their hands full this week, putting in over 60 hours of research on their various projects which will be sent back to Earth on the same Dragon capsule in May. Experiments involving osteocytes, nematodes, and more were analyzed by the crew. One new experiment is particularly interesting: the assessment of synthetic muscles made from carbon fiber that may one day power robots in micro-gravity. The carbon fibers are actually electroactive polymers that respond to electrical impulses (and reversal thereof) to expand and contract. Having already been exposed to various harsh elements on earth, the samples sent to the ISS were created with a variety of additives and coatings, and will be examined for solar or cosmic radiation damage after 90 days of exposure in space. This will help determine how best they could serve in a harsh environment like deep space, although the fibers could also help injured humans on Earth. Dr. Lenore Rasmussen, the founder of Ras Labs (the creator of the robot muscles) explained, "I envisioned designing something as delicate as a human hand with customized motion and control for an individual's needs, restoring mobility and freedom to those who have been injured." A sample of synthetic space muscle. With the ability to withstand temperatures as cold as the depths of space (-450 degrees Fahrenheit) to above the boiling point of water (275 degrees Fahrenheit), the synthetically-buff robots could work in space other other dangerous environments (like nuclear cleanup sites) while maintaining a range of motion. Since the synthetic muscle fibers directly convert energy to motion, a whole new paradigm for streamlining moving machines could now be in force. And where better to take it to the extreme than the ISS? However, even astronauts want to chill a bit after working on all this scrupulous science, and now they can enjoy a proper coffee break, just like back on Earth! Thanks to the arrival of the ISSpresso machine, the ISS crew can brew up all kinds of hot beverages including regular coffee, tea, and espresso. One fascinating facet of this is a new type of coffee cup, initially designed by astronaut Don Pettit while he was aboard the ISS in 2008.
and now it's an official thing. Yay, innovation! The cups, which are made from a lightweight, flexible polymer, enable astronauts to sip coffee out of a semi-normal vessel and not a pouch with a straw. Experiments regarding fluid dynamics and surface tension in micro-gravity led to the breakthrough (basically because Pettit just really wanted a regular cup of coffee.) The cups function by allowing the lips to make a seal on one end, and to let the user's nose hover over the bowl of the vessel to experience the aromas therein. These cups are not only a fun and "normal" thing to make ISS crewmembers feel at home, but also can save a significant amount of space (since all other beverages are packed in bags that must be retained and returned to earth after use.) The cups could cut down on launch weight (saving room for more science) and are even able to be made on the fly by the station's onboard 3-D printer. Cheers to that! 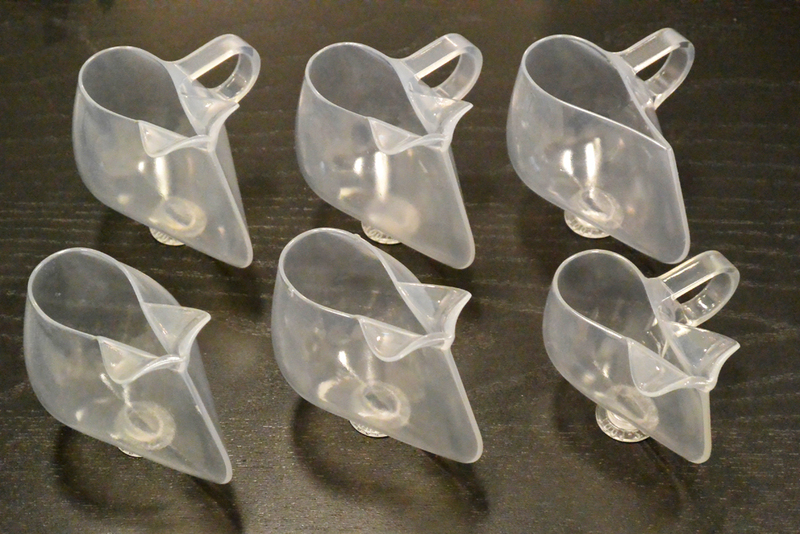 Sip like a spaceman: new micro-gravity coffee cups. In other news, astronaut Scott Kelly, now well underway on his One Year Crew mission, has made his spacey sojourn even more interesting for the viewers at home. Kelly will be posting images of the Earth that he captures from the ISS, and posting them on his Twitter. Earthlings will then guess the geography, and the first correct reply as to where over the world Kelly shot the pic from will win a photo of the geographical feature autographed by Kelly when he returns home. More details on the contest can be found here. Want to revel in ISS goodness every day of the week? Check out their updated new website here. All about that space! That's all for this week, Earthlings. Tune in next week for more orbital awesomeness...watch this space! The ISS celebrated Earth Day (4.22.15) in fine form.